Most pages that contain text and images will be classified as General Content Pages. If you remember in our example site, we designated the Staff page as a General Content Page. Now that we are ready to start inputting text and images into our Staff page, we will click the Manage Content button next to Staff in our Content menu screen inside of the About Us expanded menu. 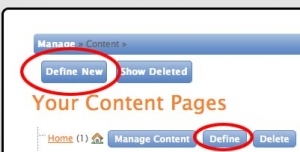 Clicking that button takes you to the General Content Page management screen shown below. On this screen is an editor, but we will explain the editor on following help screens. You will input the text and images for your page into this editor. Once you have learned more about the CK Editor, you will discover it's many capabilities to make your page unique. Note: The RTV Dealer Sites and RTV Agent Sites do not have this feature... yet. The Adding new pages outline is in the second sidebar area. That particular area can be edited from each page. So each page has the ability to have it's own unique content in its sidebar. Your site comes with some sample packages already, but you will probably want to add more packages, either to an existing page or to a whole new page. We have pre-built package templates that will easily help you do that. 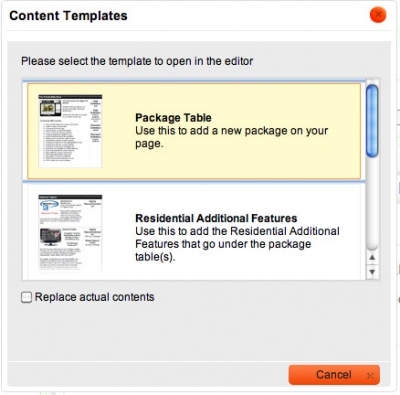 Open or create the page that you want to put a new package onto. IMPORTANT! 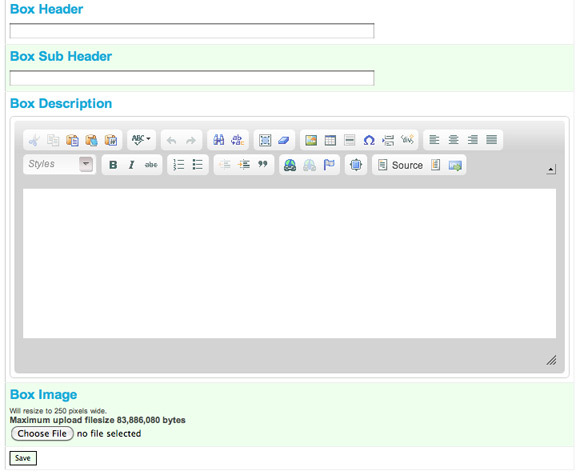 If you are creating a new package page, make sure you nest it inside the packages folder in your CMS. The standard URL for package pages inside that folder begins with packages-. This means that the initial title of the page should look similar to this: 'Packages Residential Real Estate,' which would produce a URL like this: 'packages-residential-real-estate.' This will trigger the system to add an 'Order a Tour' button at the top of the page. If you don't want your page title to start with Packages, you can go back after the page is created and change the title on the 'Define' screen for that page. Then place your cursor on that page where you want the new package to begin. IMPORTANT! If the new package is to go below an existing package, and you want it to touch that package without a gap between them, you must place your cursor to the RIGHT of the existing package that you want above your new package (not below it). Watch the demo below to see that being done properly. Commercial Additonal Features: Same as the Residential Additional Features, but these are specific to commercial packages. Inventory Additional Features: Same as the Residential Additional Features, but these are specific to inventory packages. Now that you have your package tables built on your page, go back into each of the packages or additional features and edit the text and/or images to your liking. 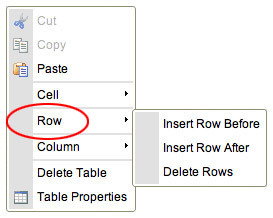 To add or delete rows in one of your tables, right click (Windows) or Control+Click (Mac) in the row you want to delete, or in the row above or below the row you want to add. Within that popup, select Row. Then insert a row or delete a row from the resulting selections. Let's move on to Table of Contents. Go ahead and click on Table of Contents in the right side bar, or on Next on the right to move on.